With our web service and worker roles in place, it's time to develop the application our drivers will use in order to confirm that the customer has accepted his/her vehicle. 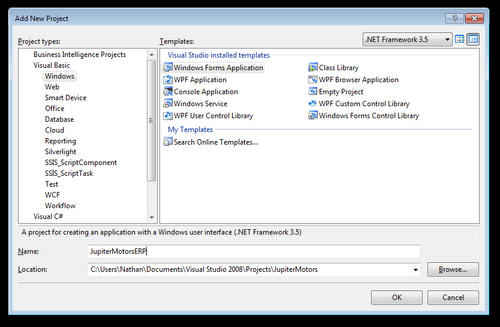 What we're about to do can be accomplished by any technology capable of calling a web service, but we'll use a simple Windows application to build on our strengths in .NET development. Our aim here is to cover some basics of Windows forms development, and one way to connect Windows Forms to Azure. Our application has two purposes.  The first purpose is to show the current status of an order. 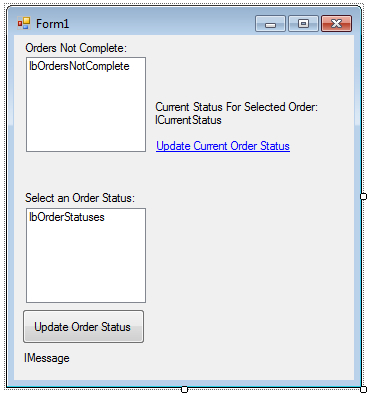 This is handled by selecting an order from the listbox and clicking a link to update a label with the selected order's status. This is done using our WCF web services by passing the OrderHeaderID to the web service and accepting the order status produced as output. The application will then update the label with the returned string. The second purpose is to be able to update status for an order by selecting the order from the listbox, selecting the new order status for the order, and clicking a button to update the order. When the button is clicked, the OrderHeaderID for the selected order and the OrderStatusID for the selected status is sent via the web service and added to the queue for processing by our worker role. 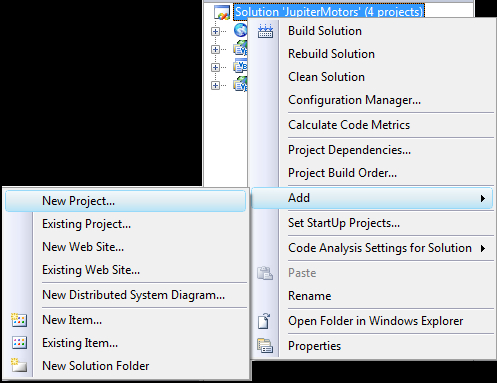 Under the project type Windows, select Windows Forms Application. 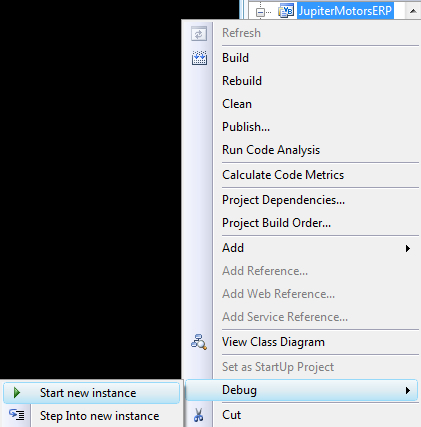 Name the project as JupiterMotorsERP and click OK.
Th﻿is will create a Form1.vb file and an app.config file. The Form1.vb will be our form design and code, whereas the app.config will hold any settings we wound need for the application. 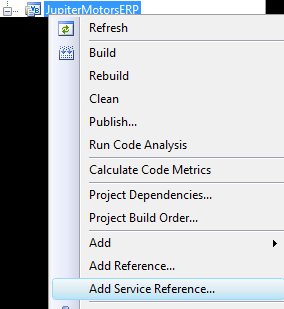 This﻿ is where Visual Studio does some great things. We can click the Discover button, and it will search the solution for available web services; we can also manually type in the URL of the service that we want to integrate with. For developing our application now, we're going to click the Discover button and let it find our web service in our WCF web role. 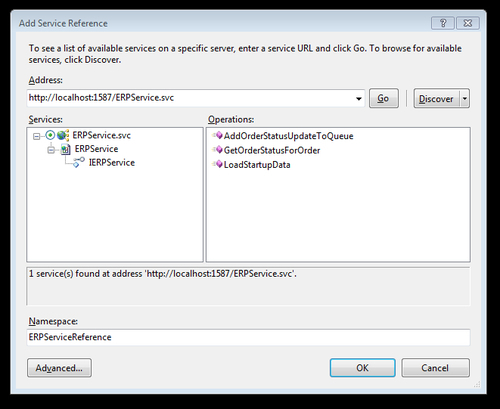 Finally, name the service reference as ERPServiceReference and click OK. This will add the necessary code to app.config. We are now ready to run the application! Now, if we double-click somewhere in the form, it will open up the code for our application. This is where we will add the following code to handle the web service calls, listbox, data bindings, and the events for the link and button clicks. To te﻿st our application, we need to run the entire solution in debug mode. We can easily do this in Visual Studio by pressing the F5 button. The web role, worker role, and WCF web role should all start up in the development fabric once the solution is built, except our local application. Once all the web and worker roles have started, we can start an instance of our local application by right-clicking on the project and selecting Debug | Start new instance. Our application will start up, bind the listboxes using the data returned from the web services, and allow us to now check the order statuses for any order not yet complete in the database. We can also change the status of any of these orders in the listbox. 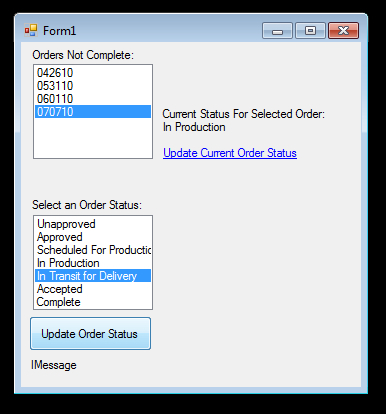 Note that the order status changes do not occur immediately. The changes are placed in the queue for processing and our worker role has a sleep timer on it. Once the worker role picks up the message, it is updated and can be checked by clicking the link and updating the label.